2019 Apple Festivals in New York - Where, When and More to Find an Apple Festival Near You! Looking for a apple festival in New York in 2019? (just scroll down the page)There is no other listing as complete and current as this list, just updated! All the apple festivals in New York we can find are listed on this page! If you love strawberries, look for a festival near you below! And I'm always looking for more apple festivals! Please write me, if you know of any to add! I update the dates as soon as the festivals publish their information, but you can always click on the links (usually the name of the festival) to see the current information on the festival's own website. Niagara County Fairgrounds, Lockport, NY. Phone: 716-433-3828. It was cancelled in 2015, but appears to be on for 2016.
and Crafters together to promote apples, small town America, and obtain monies for future endeavors. , Hours: Saturday 9 am to 6 pm and Sunday 9 am to 5 pm. Free Parking. Admission: $4 Admissions ($3 advanced tickets available at LaFayette McDonald's). Pie Contest, Scarecrow Contest, King and Queen Contest. Please No Pets. Map & Directions. Warwick, New York. Phone: 845-987-8300. Email: [email protected]. Applefest began in 1989 as a simple harvest celebration. Named one of the "Top 100 Events" in the country, over 30,000 visitors now attend the one-day event, traveling from neighboring states to experience the extraordinary variety of Warwick's apples, culture, and entertainment. Admission is FREE. Over 200 craft vendors. Dozens of food vendors. 50 local non-profit exhibitors. Music & entertainment on several stages all day!. Children's Carnival. Farmers' Market. Walk to Village shops, restaurants & businesses. Apple Pie Baking Contest (slices for sale!). Fun for the whole family! Brewerton Speedway, 60 US-11, Central Square, NY 13036. Email: [email protected]. Our festival features lots of crafts, free entertainment and demonstrations, amusement rides, games, a variety of food, and fun for the entire family. If you would like to view more Apple Festival photos, please click here. Area non-profit organizations are encouraged to participate by having a booth of their own. If you are interested in joining the fun, please e-mail us. We are always looking for new ideas! Our Festival is always held on the last full weekend in September, so mark us on your calendar for September 22nd thru 46th, 2017. Click here for directions to the Festival, or call 315-675-8232 for more information. Queens County Farm Museum Apple Festival - apple festival and corn maze on a Sunday in early October, 11:00 a.m.-4:00 pm (one-day event, see website for exact date each year). 7350 Little Neck Parkway. Floral Park, NY 11004. Phone: (718) 347-3276. Email: [email protected]. 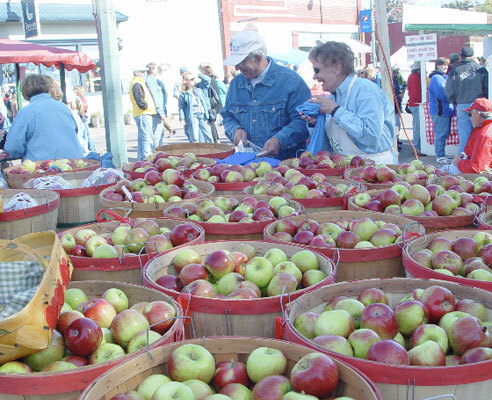 October Apple Festival, A large variety of apples, apple products, and freshly pressed cider will be available. The nation's largest apple cobbler will be baked on site. Enjoy cider pressing demonstrations while leaning fun apple facts at this delightful event. Vendors will have a variety of collectibles for sale, food, hayrides and free children's games will make this event fun for all ages. Admission: free. Hilton Applefest - always scheduled for the weekend preceding the Columbus Day weekend. Columbus Day is always the 2nd Monday in October. Therefore, the Hilton Apple Fest is scheduled for the preceding weekend; 10:00am to 5:00pm on Saturday, and from 10:00am to 4:30pm on Sunday..
Hilton Community Center, Hilton, NY. Phone: 716-234-3378. Hilton Apple Fest 2016 is held Rain or Shine. Held every year in Hilton, New York our festival gets bigger and better each year! There is a special entertainment for kids of all ages. Singers, magicians, clowns and puppet shows have all been featured at the 'Kids Korner' in past Apple Fests. Check the entertainment line-up for children's entertainment. Ithaca, NY (downtown). Phone: (607) 277-8679. Ithaca's premier event of the Fall, Apple Harvest Festival is a three day celebration of food, fun, and apples! And a kick-off event to begin Finger Lakes Cider Week 2015! Come taste regional ciders and talk with the makers. The Great Downtown Ithaca Apple Harvest Festival set to take place on Friday (12pm-6pm), Saturday (10am-6pm) and Sunday (10am-6pm). Sample local wines and cider, stock up on local produce, savor locally baked goods, be entertained by musicians, and more. Plan to experience a play performed by Johnny Appleseed, a puppet show performed by Tom Knight, the "History of Apples by Ray" discussion, a climbing wall, and great music in the Bernie Milton Pavilion. Farmer's Market Friday will close at 6:00 p.m. On Saturday and Sunday the Commons will again be filled with great food, produce and entertainment, plus a craft show and amusement rides will appear on Cayuga and State St. The festivities begin at 11:00 a.m. and continue to 6:00 p.m. each day. Plan to experience live music and community dances plus an apple pie eating contest, the hand made craft fair, amusement rides and more. Click here for a link to our Facebook page. West Strand Park, Kingston, NY. Phone: 845-334-2760.The Hudson Valley Apple Festival is held annually on the first weekend of autumn in Germantown, NY and the proceeds from the event make it possible for the Germantown Lions Club to provide support for local charities, as well as assist those in the community with hearing and vision needs. Admission is $5.00 for ages 14 and older. Admission includes: children's activities, family hayrides, live music, an apple crate derby & much more! See the full schedule for the day HERE.